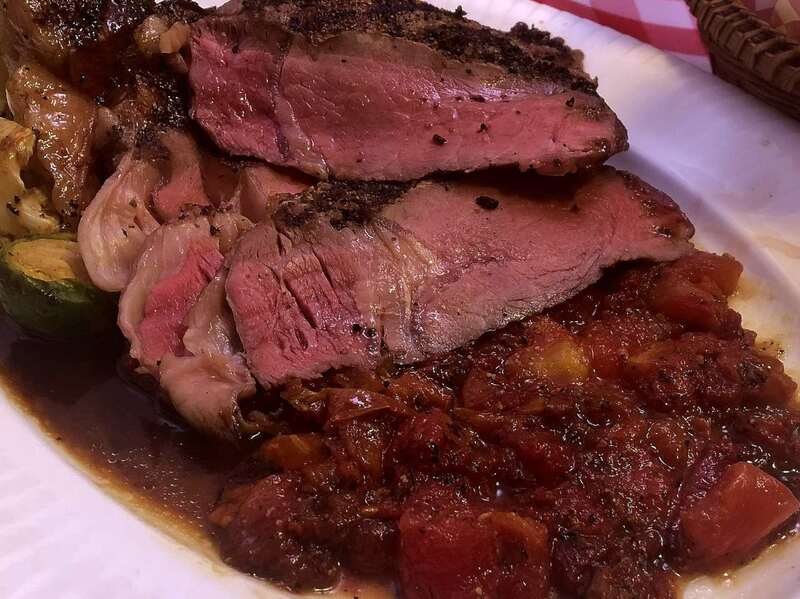 This hearty cut is popular in several different configurations, bone-in, boneless, as a roast or, in this case, as a single portion steak. Ground Black Pepper, 1 Tablespoon/Kilogram. Parsley, dried, 0.5 cup/100 ml. Egg whites, 1 each/lb/450 g.
Standard home 12″/300 mm skillet or grill/griddle. If you want to use self sealing bags (Ziploc freezer bags) for this, remove the air from the bag using the water displacement method. 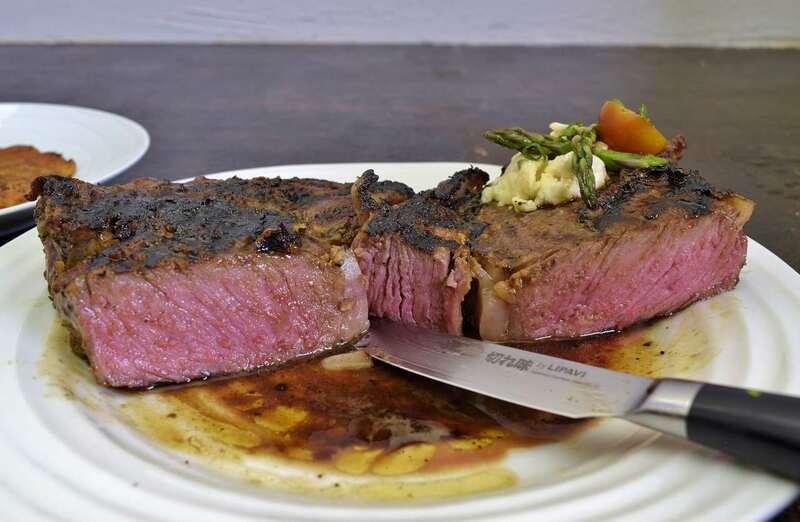 There is debate as to the exact definition of “rare,” “medium rare,” “au point,” etc. A little practice will help you learn just exactly what temperature achieves your preferred appearance of doneness. 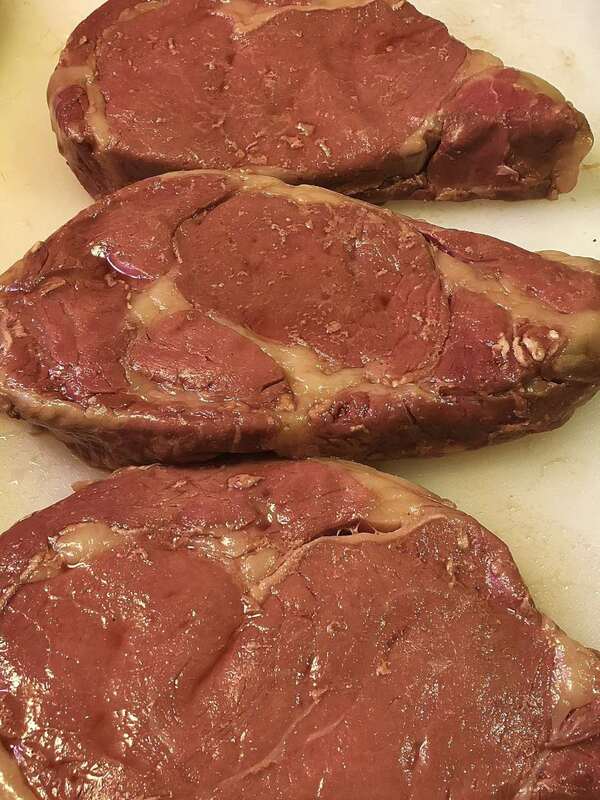 Medium well: 150 F/66 C.
Well done: 165 F/74 C.
For enthusiasts who like their steaks extremely rare, they can be processed at temperatures as low as 122F /50 C; HOWEVER, in this case the steaks will not achieve pasteurization, so the processing time MUST be limited to TWO HOURS in order to meet USDA standards of food safety. The steaks should then be consumed immediately, just as one would if sous vide were not being utilized. 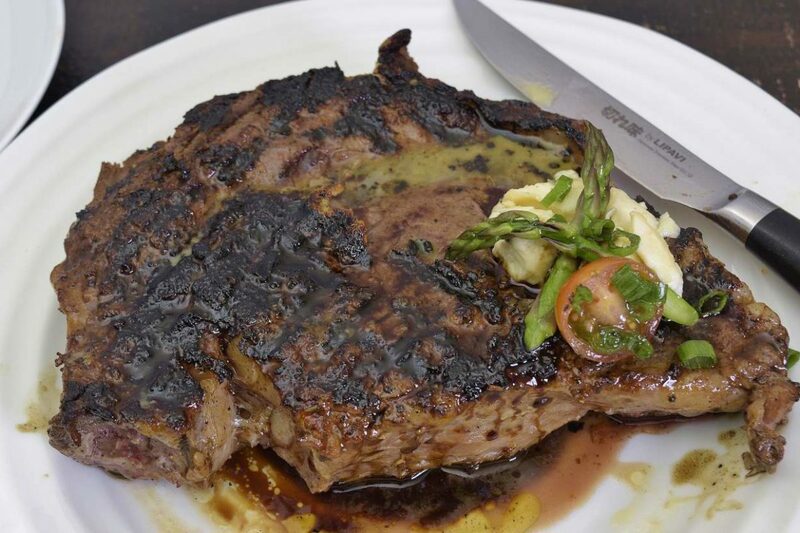 Once your steak(s) are processed, you can season, sear and serve right away if you so prefer. I recommend letting them sit at room temperature for no more than 15 minutes so the surface can cool off a little. This prevents the internal temperature of the steak from exceeding the original target temperature. If you would like to serve the more elaborate presentation displayed in this recipe, be sure to read the next steps BEFORE you process the steaks. Remove the steaks from the bags and harvest the juices, save for later use (or discard). 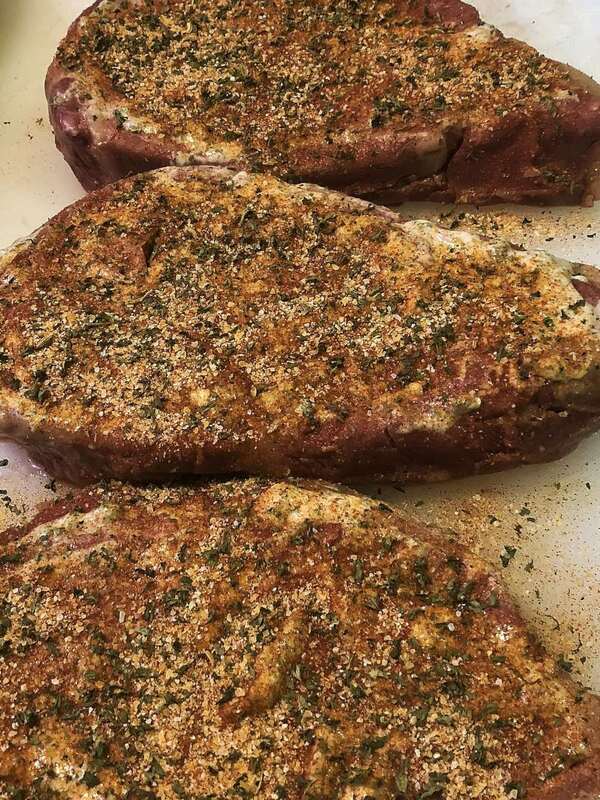 Coat lightly with the egg white and then sprinkle the steaks with the seasonings on one side–they can be sprinkled on both sides, added later, or avoided altogether–the seasonings are not part of the chemistry! Sear the individual steaks on high heat. 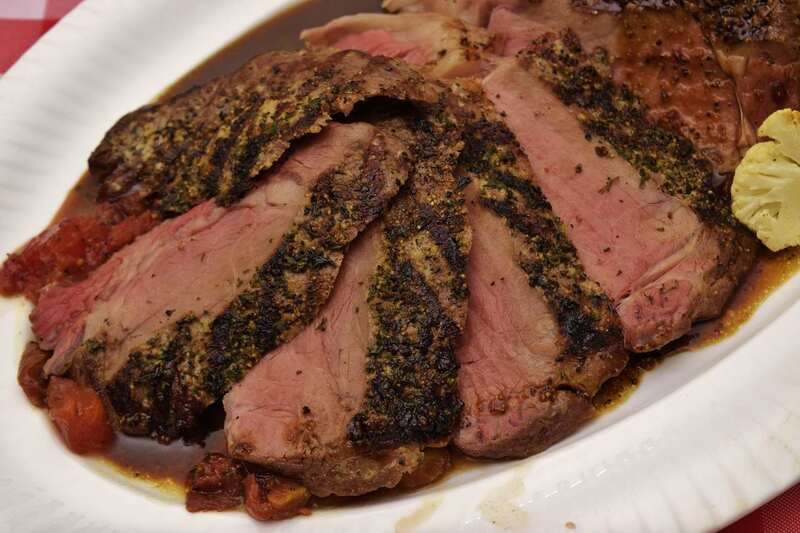 The surface should be approximately 375 F/190 C. Avoid moving or excessively flipping the steaks–this cools the pan. This process usually takes about one to two minutes per side. The steaks do not require any further cooking, so one need only achieve the desired color. Remove from heat and coat the steaks with a little butter, allow to rest for two minutes. At service, if the steak is served whole it should be presented as depicted above–with the rounded side away from the diner. And there is a reason! MOST people take their fork in their left hand and their knife in the right hand to cut their steak (apologies to lefties). Logically, they take their first “stab” at approximately the “7 o’clock” position, which will lead them to this favorable and most tender first impression. On the right end, you can see see a distinct, triangular nugget of meat that is alternately called the head or the tail, depending on chefs’ viewpoints. Although delicious and unctuous, this is a the least tender piece of the steak and many people run out of appetite before they actually get to it. The rest of us look forward to testing our jaw muscles on this flavorful section. Some contemporaries opt for the “chunky” presentation to display the apparent doneness upon presentation to the diner. The steak can also be shingled and fanned out like below, clearly and colorfully calling out to the heartiest appetite, or even two of them! Vegetables are almost an afterthought, but almost anything goes well with steak–if you look carefully, you can see Brussels sprouts, cauliflower, and mushrooms peaking out here and there. Demi-glace is a long and arduous process, but there are a number of excellent prepared versions available–a few drops goes a long way! 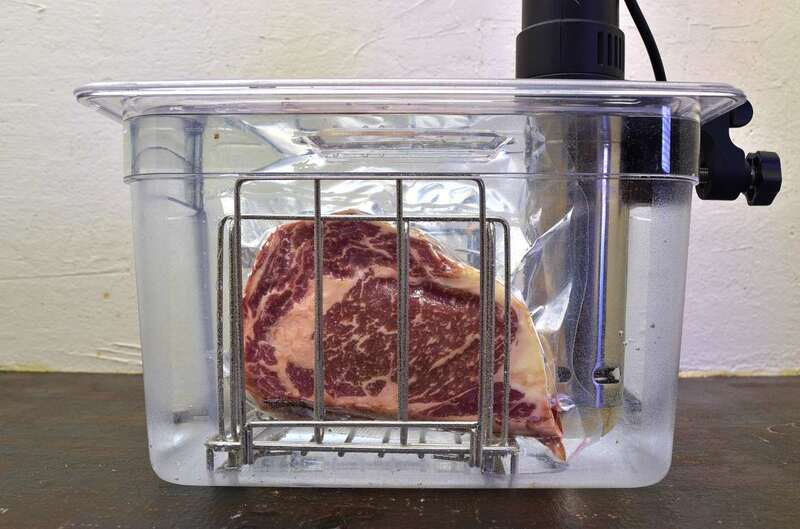 Sous vide processing a rib eye steak is one of the simplest procedures of the technology. Sadly, there is one service aspect of this dish that is frequently neglected. 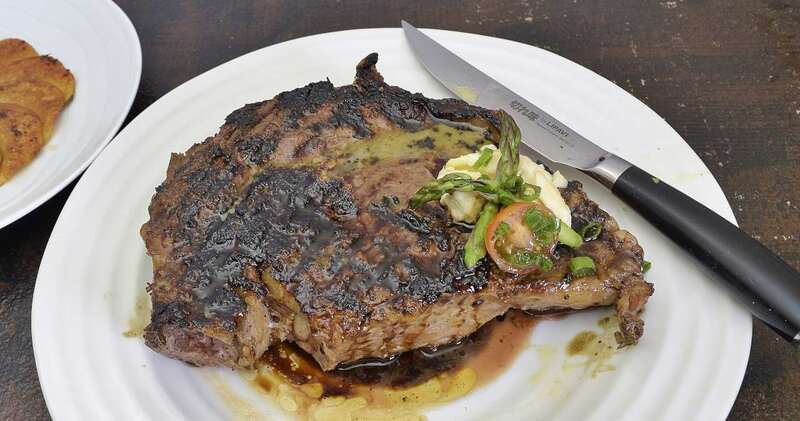 The positioning of the steak on the plate as the diner faces it determines whether the steak is perceived to be tough or tender, lean or fatty. Most people, and even most chefs seem totally oblivious to this. Watch and read carefully as we explain the ins and outs of this presentation.